Pistachio Macarons - Let the Baking Begin! Pistachio Macarons – Fragile Almond Meringue cookie flavored with Pistachios and sandwiched with Pistachio French Buttercream. In the past, I have made macarons with all kinds of fillings, but now it’s time to experiment with different macaron shells. I have made coconut and hazelnut macarons and now I decided to see what Pistachio Macarons will taste like. The “rule of macarons” says that you can make the macarons with any kind of nut flour, as long as 50% of the flour is still almond flour. So following this rule I have gotten a great result. The key to bringing out the pistachio flavor is to sprinkle each cookie with some chopped pistachios. Otherwise, the 50 grams of pistachios that we added to the batter will barely taste like pistachios. Adding the chopped pistachios to the buttercream is optional, you can add it if you want to, but I did not. I used the classic French buttercream filling and the combination was nothing short of perfect! 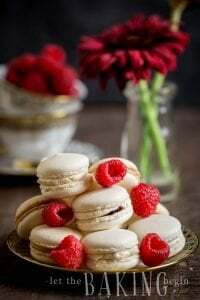 This recipe uses the French Macaron method for making macarons, but if you would like you can use the Italian macaron method as well. 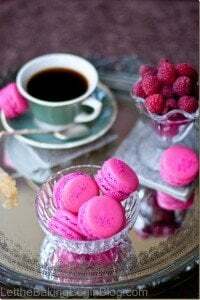 That post has a troubleshooting guide and answers a lot of common questions about macarons, so it might be a good idea to read it before making this recipe as well. 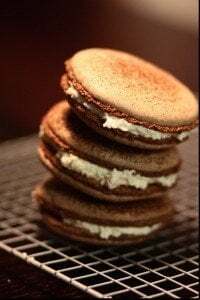 If you use my Italian Macaron Recipe to make the macaron shells, double the recipe for the French buttercream to accommodate the increased amount of macarons that come out from that recipe as opposed to this one. 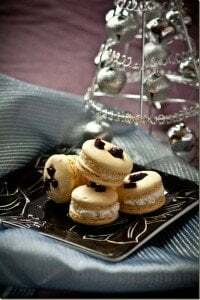 To check out ALL other Macaron Recipes I have made click HERE. Pistachio Macarons - Fragile Almond Meringue cookie flavored with Pistachios and sandwiched with pistachio buttercream. Preheat oven to 300F. Line 2 jelly roll sheets with parchment paper or Silpat. Prepare 2 piping bags with a 1/2 inch round tip. In a bowl of a food processor, combine 200 grams powdered sugar, 50 grams almond flour and 50 grams peeled pistachios. Pulse to combine, about 20 seconds. Then pulverize for about 3-4 minutes until a very fine mixture forms, stopping several times to scrape the sides. Set aside. Fill the piping bag with batter and pipe out 1 inch circles onto parchment paper about 1.5 inches apart. Sprinkle the piped macarons with chopped pistachios. Slide the first sheet in the oven and bake for 10-12 minutes, until the tops are dry to the touch and lift off cleanly off the parchment paper. For the second batch, either wait until the baking sheet cools to room temperature or use a different one and also bake for 10-12 minutes. Baking times might vary depending on the oven, so go by how the macarons come off the parchment paper. Carefully peel off the baked macaron shells by lifting them off the parchment paper. Combine the sugar and water in a small saucepan and cook the syrup to soft ball stage (that’s when a drop of syrup, dropped into a glass of water can be formed into a soft ball). Whip the butter for about 3 minutes. With a stand mixer, whip the egg to soft peaks. Without stopping the mixer, carefully pour in the syrup between the whip attachment and the bowl. Whip until the bowl feels cool to the touch. When the egg has cooled, without stopping the mixer add 1 the whipped butter 1 tablespoon at a time. Next, add the vanilla extract. The mixture might become runny and might look curdled, continue to whip and it will come together into a smooth buttercream. Lastly, add the chopped pistachios if you wish. Fill the pastry bag (or a ziplock bag) with the French buttercream. Pair the cookies by size and sandwich them with the buttercream. 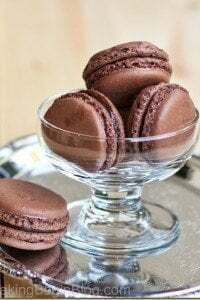 Let the macarons sit in a tightly closed container 24 - 48 hours at room temperature or in the fridge OR until the middle of the cookie is almost fudge-like and the tops are still crispy. Bring to room temperature before serving. These are fabulous I just can’t get the filling right!?!? Last few times it was sort of watery, but still held together somewhat, last night I tried but it flopped once I added the sugar water in with the egg? I couldn’t remember if I had just used the egg white last time? The whole egg didn’t really whip up?? How is it supposed to look? I was hoping I could find a video on you making the filling? 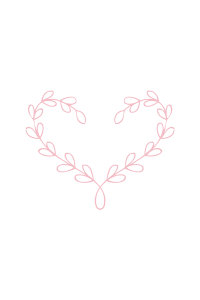 any help would be wonderful! It might be that you needed to whip the eggs for longer to achieve the desired consistency. Was the egg still smooth when you added the syrup? If you added the syrup too fast, it might’ve overcooked the eggs and curdled them, in which case you would have to start over. Or, another reason might be that the sugar wasn’t cooked to the proper temperature, in which case the water that was undissolved in the syrup has ruined the eggs by making them too thin. Here’s a video of how to make French Buttercream like the one in this recipe. Hi Marina, I don’t see the video?? I’m sorry, not sure what happened and why the video did not link up. I edited my earlier comment and hopefully, it shows now. Let me know if you still don’t see it. In the icing I assume it’s just the white of the meringue you whip up? I just says one egg and doesn’t mention splitting it but I assume it would be without the yolk? This particular cream is made with the whole egg, that’s why it doesn’t mention splitting it. Why 3 stars though ? Have featured these lovely macarons on the site today! Please tell me you mean chopped pistachios and not peeled pistachios? I’ve seen several recipes that call for actually peeling the pistachios after shelling them, and I’d like to avoid that if possible! Hi, I was wondering will omitting pistachios make plain macarons? Do not omit pistachios, instead replace the pistachios with ground almond flour. Better yet, see other recipes that will have plain flavored macaron shells, here on the blog. Also, u don’t let ur piped macarons sit out on the countertop before baking them? Hi Oksana, I used roasted pistachios and I think they were very lightly salted, I just took them out of the shells and ground them. I had hard time finding raw ones as well, so I used what I could find. And if you do want the raw ones, you can probably find them online. I was wondering do pistachios have to be raw or not? You can use either raw or roasted. Those will be gone in one second in my house. Great explanations in your recipe, very helpful! ooh, I love pistachio as a flavor. That pale green color, even if it is just food coloring, is SO pretty! Making macarons seems intimidating, but one day I will!